A Brief History of The Conan Doyle (Crowborough) Establishment. See below for Conan Doyle Establishment Contact Details. Having worked without an official title since 1953, The Conan Doyle (Crowborough) Establishment - the title suggested by Dame Jean Conan. Doyle - was initiated on 22 May 1989, the 130th anniversary of Sir Arthur's birth, by a small group of enthusiasts seeking to promote further recognition of Conan Doyle. Hence its subtitle “A Venture To Promote The Life And Works Of Sir Arthur Conan Doyle". The founder was Malcolm Payne, a retired teacher, educational psychologist and local historian. Some of his relations were members of staff at Windlesham, Sir Arthur's Crowborough residence for 23 years. Sir Arthur gave many items in our memorabilia collection to members of his staff, some of whom later passed them onto Malcolm. With the support of Tony Yates and his wife Marian, then licensees of The Crowborough Cross public house, a bar was turned into The Conan Doyle Room and housed our collection of Conan Doyle photographs, sketches, illustrations, maps, ephemera and archive material. Tony sadly passed away just two weeks before the official inauguration and opening of the room. Until 1995 the collection remained in the room and attracted many visitors, but due to refurbishment we had to remove the collection. Through Malcolm Payne's negotiations with Andrew de Candole, the owner of Groombridge Place, the whole ACD collection was installed as a museum centerpiece there and attracted many visitors from all around the world. The museum was officially opened by Mrs. Georgina Doyle, with Dame Jean Conan Doyle in attendance on July 1st 1995. In a letter to Malcolm Payne, Dame Jean an hearing of the new location for Conan Doyle Collection, and of the memorial in the grounds of Groombridge Place, wrote ... .its good news that the collection would be moving to Groombridge Place. My father went over there whenever we had guests staying at Windlesham who hadn’t stayed before. He was fascinated by the old house and felt that by showing it off to visitors from overseas he was introducing them to the very essence of England. Yes - if your collection cannot be in Crowborough, then Groombridge is quite the most suitable place for it ... a splendid achievement ... (as is) the happy news that there will be a memorial to my father in the gardens of Groombridge Place". Not only was Sir Arthur a frequent visitor to the house, he also used it as a model for Birlstone Manor in the Holmes adventure The Valley of Fear. The Establishment erected a plaque - the Sir Arthur Conan Doyle Memorial - on Terrace Montargis in the town center on 23 May 1992. An event jointly hosted with Crowborough Town Council. The plaque was unveiled by Miss Doreen Latter and Mrs. Merle Fielding, both two daughters of Mr. William Latter, chauffeur to Sir Arthur for many years. Dame Jean Conan Doyle and very many visiting societies were in attendance at the reception and unveiling. In the past we have issued various limited first day cover stamps connected with Conan Doyle and Holmes. We have had three publications printed "Recollections of Sir Arthur Conan Doyle" by Malcolm Payne (1993) and "Sir Arthur Conan Doyle and Groombridge Place" by Malcolm Payne and Philip Weller (1995), these are still available. Doctor Arthur Conan Doyle and the Boer War by Philip Weller (2000) sold out soon after publication and is not available. Malcolm Payne the first Curator and Founder passed away on Friday 30th May 1997, but we still provide assistance for those involved in any research into the life of Sir Arthur, his works and his and his family's life in Crowborough. We can also provide talks and guided tours of the area, although it should be noted that access to any properties formerly connected with Sir Arthur is not always available. The work of The Establishment relates primarily to Sir Arthur, his life and works, which includes introducing researchers to not only Sherlock Holmes, but to his other great works. Any costs involved must be covered by the enquirer, as such funds as The Establishment raises, through the sale of publications and donations, are devoted to furthering Doylean scholarship and to the maintenance of the plaque commemorating Sir Arthur located at Montargis Terrace in Crowborough. The Establishment members were actively involved in the few Sherlock Holmes Festivals that were held in Crowborough. These were reasonably successful but soon lost support and funding and are no longer held. 1999 was the 10th anniversary of our official formation. It was not planned to move the collection, but the opportunity did arise and it meant that we celebrated the anniversary and our new home in one event. It was always Malcolm Payne's wish that one day The Collection would return to the Town of Crowborough and with the greatly appreciated help from Mrs. Alison Banks, the Principal at Beacon Community College, we realised Malcolm's wish. Due circumstances beyond our control the Collection has now been removed and is in storage. The Curator, Brian W. Pugh and Founder Member Richard Greep represented the Establishment on The Conan Doyle Statue Trust. The Trust was set up to raise funds for the Arthur Conan Doyle Statue. 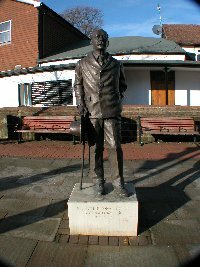 With the financial help from the Town Council and various other donations the statue now stands at Cloke's Comer, Crowborough. Our Patron, Mrs. Georgina Doyle unveiled this on 14th April 2001. At the present The Establishment holds informal meetings during the year. May 22nd to celebrate the birth of ACD and our AGM and July 7th to remember the passing of ACD, and in November we meet for Remembrance Sunday.